Britain-based Pinkstinks advocates against putting girls "into a pretty little box" through aggressively pink and beauty-oriented toys. I'm all for it. 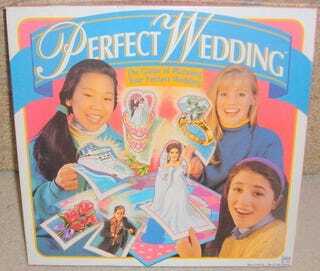 But how do I explain my childhood obsession with an inexcusable little game called Perfect Wedding? Emma Moore says she's growing more determined as she sees her 7-year-old beginning to worry about her looks and weight. "I'm definitely motivated by not wanting to catch her looking in the mirror and saying 'I hate my body, I hate myself.'" Of course, the Moores are by no means the first to notice that the notion that women are alternately decorative and motherly starts at the toy store. (Interestingly, they argue that it has gotten worse lately, perhaps as a result of increased anxiety over blurred gender roles.) Women influenced by second-wave feminism raised a generation of girls — many Jezebel staffers among them — who were steered away from such messages with the best of intentions. Naturally, in a universe where sexist toys stubbornly stuck around, this made them all the more alluring. I don't remember how Perfect Wedding came into the picture, whether it was a gift or my own autonomous buy-in into the wedding industrial complex. From a feminist perspective, it's hard to imagine a more offensive concoction. In my recollection, you competed to purchase everything — the ring, the dress, the honeymoon — but the groom. In fact, the Internet serves better than my memory: You also purchase the groom. I am by no means alone in having had these childhood proclivities. By now, playing with Barbie is the universal symbol of conflicted anti-sexist impulses. And Barbie herself is the tip of the iceberg. "Not just Barbie, but I had a Barbie LAUNDROMAT," says Jessica. "I wanted her doing housework, like a woman should!" Hortense loved her easy-bake oven. "Even though it made brownies that tasted like dirt." Yet here we are, studiously deployed in the combat of such messages to girls and women. We somehow emerged intact — not immune to internalized sexism, of course, but able to think clearly and beyond it. Was my love of Perfect Wedding a form of Stockholm Syndrome, its effective antidote parents who expected me to be more than a future wife and an internship at Ms.? Or was it just a really, evilly fun game and not much more?